Legislation that would reduce Missouri’s highest personal income tax rate from 5.9 to five percent could be debated by the House in Jefferson City this week. Missouri House Speaker Todd Richardson, R-Poplar Bluff, spoke to the Capitol Press Corps about Speaker Pro Tem Elijah Haahr’s tax reform bill, right before the Easter break. “Our intent all along has been to work with our colleagues on the other end of the building (the Missouri Senate), as well as our colleagues here in the House to come up with a broad-based tax reform bill that we could get all the way through the process,” Richardson says. Haahr’s 429-page legislation also reduces Missouri’s corporate income tax from 6.25 to five percent. Haahr, R-Springfield, notes his bill is also aimed at providing funding for Missouri’s deteriorating roads and bridges. It would index vehicle user fees to the cost of inflation. Haahr testified before the Missouri House Ways and Means Committee in March, saying that change would generate about $174 million annually for the state’s road fund. Haahr says the state’s current vehicle license and registration fees haven’t changed in more than 30 years. Missouri House Transportation Committee Chairman Bill Reiboldt, R-Neosho, has a competing version, which would place a ten-cent gasoline tax increase before voters in November. Meantime, a top Missouri House Democrat says neighboring Kansas “fell apart” because of massive tax cuts. House Assistant Minority Leader Gina Mitten, D-St. Louis, has concerns with GOP tax cut plans in both the Missouri House and Senate. “We’ve already talked about the fact that our public education is in trouble, our roads and bridges are in trouble, our seniors are in trouble, what more trouble do we need to put Missourians in just to win elections,” Mitten says. Haahr says his bill would transform Missouri’s tax system to the most competitive in the nation. 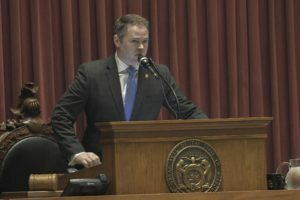 This is a short week in the Missouri House, because of the Easter break. Lawmakers were off on Monday and didn’t return to Jefferson City until Tuesday afternoon. Missouri Senator Roy Blunt (R) is scheduled to address the House on Wednesday morning.